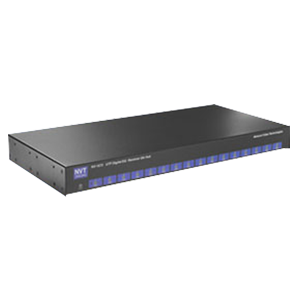 Employing NVT‘s DigitalEQ™ technology, the NV-1672 is an 16-channel active (amplified) hub that allows the transmission of full-motion monochrome or color video for distances up to 1 mile (1,6km) using Category 2 or better unshielded twisted-pair (UTP) wire. The receiver hub continuously and automatically conditions the video signal, compensating for cable attenuation, wiring polarity, ground loops, and voltage transients, independent of video signal content. Coax Jumper Cables (8) Coax Jumper Cables 2ft pack of 8 each. Hub Wall Mounting Kit (Accessory) Provides convenient wall mounting option for NVT hub products.